Warm, comforting and hearty. An Italian classic during the colder months. 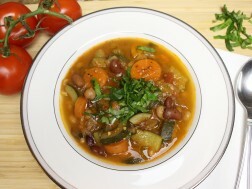 Minestrone is a thick soup of Italian origin made with vegetables, beans and often with the addition of pasta. Our version is as delicious as our Momma’s, but we’ve omitted the grains to make it gluten-free and a little lighter, yet is still loaded up with nutrient-dense veggies and fibre-rich legumes, and is satisfyingly creamy from the zucchini. Makes a great healthy starter or nourishing main for dinner. Over medium heat, heat the olive oil in a large soup pot and sauté the onions, carrots and celery until tender. Add zucchini, chopped tomatoes and tomato paste and stir. Add in the vegetable stock/ water and bring to a boil. Add beans and oregano and lower heat to low, cover and cook for 45 minutes, stirring occasionally. Taste and season with salt if needed. Uncover, add the leafy greens and cook for another 15 minutes. Serve and garnish with freshly ground pepper.